The Kings scored three power play goals in the 2nd period, coming from behind to beat the Rangers, 4-2, Sunday night in Los Angeles. It was New York’s 2nd straight loss; they are 2-5 in their last seven games. After David Desharnais and Jimmy Vesey gave the Rangers a 2-0 lead after 20 minutes, a fight between Brendan Smith and Adrian Kempe after the period – plus an additional roughing penalty on Smith – seemed to energize the Kings, and gave them a power play to start the 2nd period. Jake Muzzin scored a power play goal just 30 into the period to make it 2-1. Michael Amadio‘s power play goal at 6:13 tied the game, 2-2. And Tanner Pearson‘s power play goal at 10:22 gave Los Angeles a 3-2 lead. It was the 2nd time this season that the Blueshirts had given up three power play goals in a game; the only other time was October 7th vs Toronto, in the 2nd game of the season. Trevor Lewis added an empty net goal with 0:18 to play in the game for the final 4-2 margin. Henrik Lundqvist stopped 26 of 29 shots. Jonathan Quick stopped 21 of 23. Amadio finished with a goal and an assist. Drew Doughty and Alec Ramirez each has two assists. The Rangers [now 24-19-5, 53 pts] continue their four-game road trip Tuesday night at Anaheim. 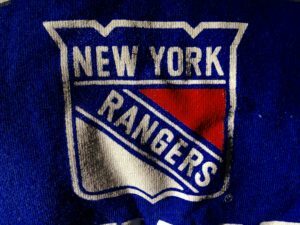 Rick Nash scored two goals – for the second game in a row – and Pavel Buchnevich‘s goal with with 3:58 to go gave the Blueshirts the lead for good, as the Rangers edged the Sabres, 4-3, Thursday night atThe Garden. Henrik Lundqvist made a highlight reel save on Sam Reinhart with 2.5 seconds to play to seal the win. Lundqvist finished with 34 saves. The teams alternated goals all game long. Nash, who broke a 12-game goal-scoring drought Tuesday night with two goals against the Flyers, got the Rangers on the board early, just 1:24 into the game, beating Robin Lehner to make it 1-0. Buffalo answered late in the period when Kyle Okposo scored a power play goal with 1:19 to go to tie the game, 1-1. In the 2nd period, J.T. Miller scored for the second straight game, scoring his 10th goal of the season, at 8:21, to make it 2-1. But Buffalo’s Justin Falk tied it, 2-2, at the 17:10 mark, with just the 3rd goal in his 245-game NHL career. In the 3rd, Nash gave New York a 3-2 lead, off an assist from Ryan McDonagh, at 6:49. It was Nash’s 13th of the season and 4th goal in the past two games. But Rasmus Ristolainen tied the game, 3-3, with a power play goal with 5:01 to play, setting the stage for Buchnevich’s heroics. Nash stole, the puck, got it to Mika Zibanejad, who skated behind the Buffalo goal, and got the puck to Buchnevich, who put it past Lehner for his 12th of the season. Buchnevich now has 28 points on the season [12 G, 16 A]. Nash finished with two goals and an assist. Buchnevich had a goal and an assist. The Rangers [now 24-17-5, 53 pts] begin a four-game Western road trip Saturday in Denver against the Colorado Avalanche. 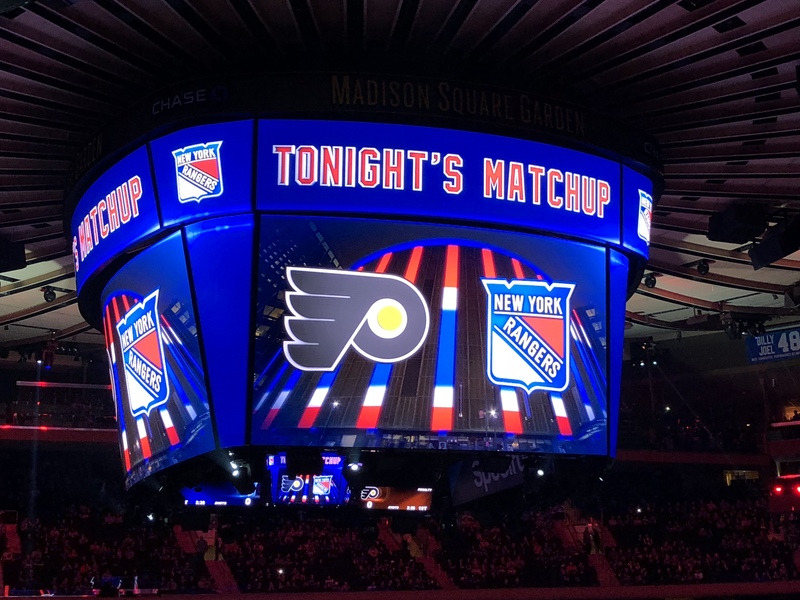 The Blueshirts awakened from their recent offensive slumber, scoring five goals and beating the Flyers, 5-1, Tuesday night at The Garden, snapping a three-game losing streak. Rick Nash scored a pair of goals to break a 12-game scoring slump, and Henrik Lundqvist stopped 25 of 26 shots for his 20th win of the season. Lundqvist is now the first player in NHL history to win at least 20 games each year in the first 13 years of his career. The Rangers had only scored 17 goals in their last nine games. It was the first time the Blueshirts had scored five goals in a game since December 9th against the Devils. The Rangers also scored an even-strength goal, a power-play goal, and a short-handed goal in the same game for the first time since March 2014. The Flyers took a 1-0 lead on their first shot of the game, when Jordan Weal deflected the puck past Lundqvist just 2:06 into the game. Then the Rangers’ offense came alive. Nash scored on a breakaway at the 6:30 mark, off a great pass from Pavel Buchnevich, to make it 1-1. J.T. Miller deflected a Ryan McDonagh shot past Brian Elliott at 16:30 for a power play goal that made it 2-1. And then Paul Carey added a short-handed goal with 0:10 to go in the period to make it 3-1. It was Carey’s 6th goal of the season; he snapped a wrist shot past Eliiott and off the post and in. It was the team’s first short-handed goal of the season. In the 2nd, Michael Grabner stole the puck and scored an unassisted goal at the 10:48 mark to make it 4-1. It was his 20th goal of the season, the 4th time in his career that Grabner hit the 20-goal mark. Nash scored his 2nd goal of the game with 2:32 to go in the period, on an assist from Marc Staal, to make it 5-1. Elliott was replaced by Michael Neuvirth in the 3rd period. Neither team scored in the final 20 minutes. The Rangers [now 23-17-5, 51 pts] host the Buffalo Sabres Thursday night at The Garden before starting a four-game road trip. The weekend turned out to be a complete bust for the Blueshirts. After losing to the Islanders, 7-2, Saturday afternoon, the Rangers blew a 2-1 lead after 20 minutes Sunday night in Pittsburgh, losing to the Penguins, 5-2. The Rangers have now lost three straight, 4 of 5, and are 3-5-2 in their last ten games. The Rangers allowed Pittsburgh 47 shots on goal, 2nd most allowed this season, and while Henrik Lundqvist played valiantly, he could not do it alone. After giving up a goal to Patric Hornqvist just 3:14 into the game, the Rangers got goals from Michael Grabner [at 15:17] and Brendan Smith [at 19:06] to take a 2-1 lead at the end of the 1st period. It was the often-scratched Smith’s first goal of the season. Midway through the 2nd period, Pittsburgh rallied to take a 3-2 lead. Dominik Smith scored his first career NHL goal at 13:15 to tie the game 2-2, and 65 seconds later, Phil Kessel scored his 20th goal of the season to make it 3-2. In the 3rd period, Sidney Crosby made it 4-2 at the 12:33 mark with his 17th of the season, off a pass from Kessel. And former Ranger Carl Hagelin added an empty-net goal with 1:59 to play for the final 5-2 margin. Hagelin and Kessel each had a goal and an assist for Pittsburgh, while Jamie Oleksiak had two assists. The Rangers were without captain Ryan McDonagh and Kevin Hayes. The Rangers [now 22-17-5, 49 pts] host the Philadelphia Flyers Tuesday night at The Garden. The Rangers, coming off a five-day break, had one of their worst games of the season Saturday afternoon, falling to the Islanders, 7-2, at The Garden. Rookie Mathew Barzal had two goals and three assists, for his 2nd five-point game of the season. Linemate Jordan Eberle had four assists, and Anthony Beauvillier had two goals and an assist to power the Islanders. Jaroslav Halak made 37 saves in the win. Shane Prince, Thomas Hickey, and Cal Clutterbuck had the other Islander goals. The slumping Rangers are now 3-4-2 in their last nine games, and 7-6-3 in the last 16 games. Kevin Hayes and Mika Zibanejad scored the goals for the Blueshirts. Ondrej Pavelec got the start in goal for the Rangers, but was pulled 6:51 into the 2nd period after giving up five goals on 14 shots and with the Blueshirts trailing 5-1. Henrik Lundqvist finished up, stopping 16 of 18 shots. The Rangers [now 22-16-5, 49 pts] get to shrug this one off quickly; they play the Penguins in Pittsburgh Sunday night. Henrik Lundqvist earned his 424th career win, out-dueling former backup Antti Raanta, as the Rangers beat the Arizona Coyotes in a shootout, 2-1, Saturday night in Glendale, Arizona. Lundqvist made 38 saves to earn his 19th win of the season. It was the 6th time in their last 9 games that the Rangers have needed more than 60 minutes to decide a winner [2 overtime wins, 2 shootout wins, 2 shootout losses]. Former Ranger Anthony Duclair scored a power-play goal at the 10:50 mark of the 1st period to make it 1-0 Arizona. Jimmy Vesey tied the game, 1-1, 5:11 into the 2nd period, with an unassisted goal. Neither team scored in the 3rd period or in the five-minute overtime. In the shootout, Mika Zibanejad beat Raanta for a goal, but Raanta stopped Pavel Buchnevich. 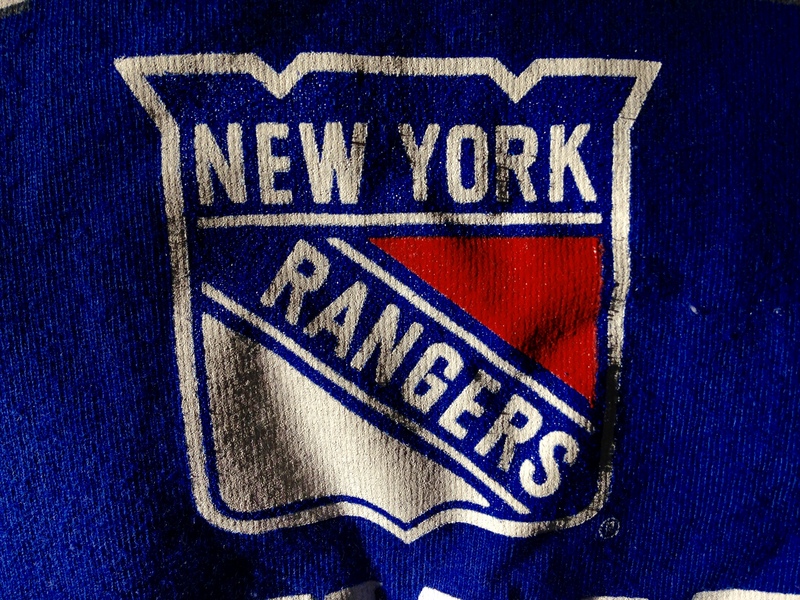 Lundqvist made saves on shots by Duclair, Clayton Keller, and former Blueshirt Derek Stepan to seal the New York win. The Rangers [now 22-14-5, 49 pts] finish the two-game road trip Sunday in Las Vegas, when they play the Vegas Golden Knights, who own the best record in the Western Conference. Patrick Sharp’s goal early in the 3rd period gave Chicago a 3-2 lead, and backup goalie Jeff Glass made 23 saves as the Blackhawks shut down the Rangers, 5-2, Wednesday night at The Garden. The 32-year-old Glass, who played 575 games for 11 teams in various minor and international leagues before making his NHL debut December 29th, was playing in place of the injured Corey Crawford. Vinnie Hinostroza gave Chicago a 1-0 lead late in the 1st period, taking a pass from Jonathan Toews and beating Henrik Lundqvist at 16:09 for his 2nd goal of the season. Nick Holden tied the game, 1-1, two minutes later with a slapshot that got past a screened Glass at 18:09. In the 2nd, Nick Schmaltz put the Blackhawks back on top, 2-1, with his 8th goal of the season at 8:56. But the Blueshirts, with a 5-on-3 advantage later in the period, tied the game at 11:53 when Mika Zibanejad‘s one-timer, off a pass from Pavel Buchnevich, made it 2-2. Sharp would score the eventual game-winner early in the 3rd period, with a blistering shot over Lundqvist’s shoulder at 2:24 that made it 3-2 Chicago. Toews [with 0:54 left] and Patrick Kane [with :05 left] scored empty net goals in the final minute for the final 5-2 margin. Toews, Kane, and Schmaltz each finished with a goal and an assist for Chicago. Lundqvist made 30 saves. The New York power play was 1-for-6. The Rangers [now 21-14-5, 47 pts] start a two-game road trip Saturday night in Glendale, AZ against the Arizona Coyotes.